The Automobile Associaton of Ireland's 1962 handbook contains six pages of guidance for people planning to cross the border between the Republic of Ireland and Northern Ireland. There are 18 approved roads with customs posts, and the AA warns that vehicles were liable for customs duty and purchase tax upon entering Northern Ireland, requiring motorists to 'lodge large sums of money at the frontier' or avoid doing so by providing a so-called 'triptyque' passbook for stamping at frontier crossings. The border section closes with a warning: motorists crossing on unapproved roads are 'liable to very severe penalties, including confiscation of [their] car.' Customs post also only had limited opening hours and late-night crossings incurred an additional fee of 2 shillings, usually paid in advance. The slow train wreck of Brexit and the connected question of the future of the only land border between the European Union and the UK has in recent years increased the interest in the history of Irish partition and the 499 km-long frontier between the Republic and Northern Ireland. Countless TV and print reports have investigated it, the border now has its own darkly funny Twitter account, and there has been a loose series of books about the border as well, first and foremost Garett Carr's 'The Rule of Land' (2017), which follows the author's trek from Carlingford Lough along the border to Lough Foyle. 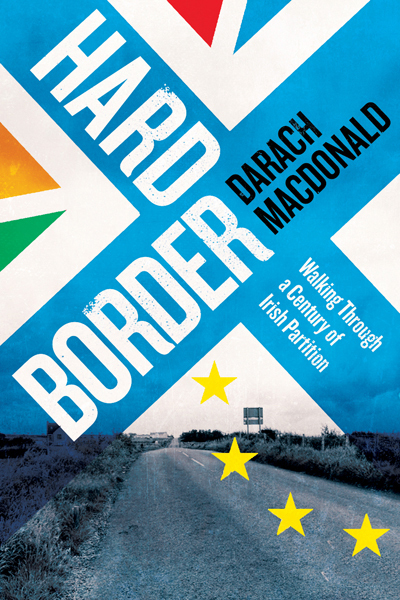 Darach MacDonald's 'Hard Border' is the latest addition to the loose canon of Irish border books, but this one zooms in a bit deeper than most. Despite the flashy cover which seems to indicate a more political look at the potential of a 'hard' border, instead this is a deeply personal look at the history of the border, and 'hard' here could also mean 'deadly'. MacDonald is a veteran journalist hailing from Clones in County Monaghan, and has written extensively about his home country and the border, most recently in ' Blood & Thunder: Inside an Ulster Protestant Band' (2010). For this later border-book, he walked the 75-kilometer route of the now-defunct Ulster Canal, which was completed in 1842 to link Lough Neagh to the Erne system but proved unsuccessful, was outstripped by the railways and the subsequent partition of Ireland and finally closed in 1932. Even though there are plans to develop a greenway along its banks, to date most of it is neglected and overgrown, which forces MacDonald through dense undergrowth and on many detours – which is almost synonymous for the tangled history of the Irish border which he encounters. Following the canal from Castle Saunderson to the Moy, the author explores both the drumlin landscape and the history of the last 100 years in the border heartlands, where five counties meet: Cavan and Monaghan in the Republic and Fermanagh, Tyrone and Armagh in Northern Ireland. Here, the border shifts and snakes around villages and roads, forming loops that almost become enclaves and exclaves (and will cause many a Brexit headache): for example, there are eight roads in and out Clones in Monaghan – five of which run into Fermanagh. The terror persisted and lapped to and fro across the border, as with the abduction and murder of Ross Hearst of Middletown in 1980. The 52-year old father of five was taken at gunpoint outside a friend's house in Tullylush, back near where the Monaghan Mushrooms plant stands today. His corpse with four bullet wounds was dumped at Wards Cross, a short distance away on the border. [...] Seamus Soroghan of Monaghan town was later convicted of the murder. Yet no sentence could allay the trauma of the Hearst family, which at the time of the father's death was still mourning the 1977 killing of his daughter Margaret Ann Hearst, a 24-year-old-single mother of a 3-year-old child, and part-time soldier in the UDR [Ulster Defence Regiment]. As an outsider from Germany, the Irish border and its effect on the communities it historically divided and still divides often reminds me of the Berlin Wall, which had similar seemingly random nooks and crannies that meant division and death for their inhabitants. There is the 'Entenschnabel', the Duck's Bill in Glienicke/Nordbahn, where a GDR neighbourhood along one street was enclosed by West Berlin on three sides, or the Eiskeller, where three West Berlin farmer families could only get to the city along a small road four metres wide and 800 meters long. And while the Irish Border was not as tightly sealed as the Berlin one, it was at least as deadly and meant similar arrangements for those affected by it. At the height of the Troubles, the five roads out of Clones into the North were closed, and just a single main route across the border remained open in the area, and any traffic wishing to pass had to go through a full military checkpoint, often resulting in long delays - and at the height of the IRA’s campaign in the 1970s and 80s most smaller lanes leading from that main road across the border were spiked, blocked with concrete blocks or blown up by the British Army. There's a lot of fighting and killing in this book, but this is no over-proportionate for the slice of Irish landscape and history it analyses – the terror, after all, was real. This is not a lighthearted romp, but also not a hopeless one. There's plenty of positive stories, like the history of the Leslie family of Glaslough and their (in)famous parties, or the stories of local entrepreneurship (like the aforementioned mushroom plant) that were made possible by the opening of the border after the Good Friday Agreement 1999. MacDonald is apprehensive about the potential impacts of Brexit, and rightly so, as his fine mix of memoir and history in 'Hard Border' properly put the border and its effect on the local communities into perspective. The only thing lacking is a detailed map, which would make it easy for those encountering the pitfalls of the Irish border for the first time to trace its weird loops – and a timeline would also have helped. But otherwise, this is a fine journey through the history of the Irish border heartlands, filled with affrays, danger, hope, a soviet in the Monaghan Lunatic Asylum and Oscar Wilde's sisters, burning to death on Halloween. I can thoroughly recommend it to both newcomers to the Irish border as well as veteran border writers and walkers. And especially to Jacob Rees-Mogg. Hard Border is published by New Island and is available through their website or from any independent bookshop.